Waffles with Asian twist use coconut milk and green natural coloring of Pandan, this waffles recipe are dairy free or you can switch with regular dairy milk as an alternative. * Whisk together flour,baking powder,salt,sugar and nutmeg in large bowl, In another bowl whisk together silk coconut milk,egg yolk,pandan paste and butter, Stir coconut milk mixture into flour mixture,add slice banana and stir until combine. *Serve waffle immediately with maple syrup,ginger syrup or fresh fruits. I surely like the twist. I didn't know that there is such a thing as pandan paste. Mmmm!! interesting to find out. Of course,how I can see no to our Asian flavor. That said, the color is so interesting, the combo of brownies and greenish shade. OMG! These look awesome and what a combination of flavours. Well done! Such yummy waffles, Ridwan! Love the Asian twist...and the strawberries and cream topping! very nice recipe, Ridwan! 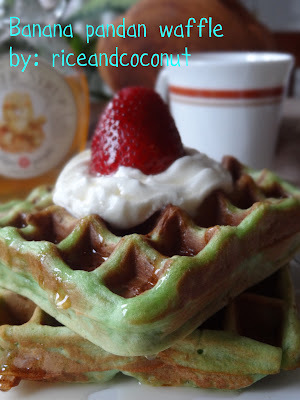 I love the sound of banana and pandan flavors in my waffle! Yummy! Sounds divine. Love the idea of using coconut milk for this recipe. Love the waffles with a truly different and delicious twist! Pandan paste is so Asian and unique...I had the pleasure of receiving some as a gift from a blogger friend from Malaysia last year. Never would have thought about using it in a waffle mix, and with coconut milk...yumm! Your waffle is lovely and beautiful. I love the contrast of color from the pandan and strawberries. Wish I can get some pandan paste in the states to try this.